Carolyn was the founding president of the Tucson Quilter’s Guild (1976) and also Old Pueblo Archaeology Center (1994). She has served on the board of the American Quilt Study Group, the Treasure Hill Foundation (Mimbres Culture preservation), the Arizona Archaeological and Historical Society, and was recently inducted into the Society of Women Geographers (the women’s association affiliated with the Explorer’s Club; she was profiled in They Made Their Mark: An Illustrated History of the Society of Woman Geographers). 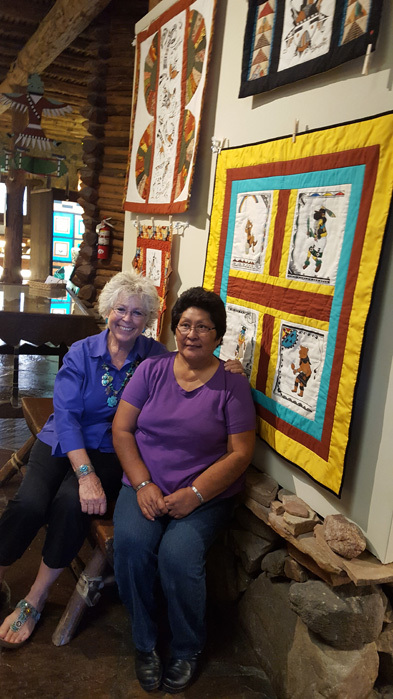 Davis has appeared on Simply Quilts, a feature program on HGTV, American Quilter on Lifetime, and assisted with a film documentary on the history of Hopi Indian quilting produced with support from PBS. In September 2010, she was inducted into the Arizona Quilter’s Hall of Fame. Kate Thomson Cory (1861-1958) — This work in progress is a biography of Kate Thomson Cory, a classically trained New York City artist who traveled west in 1905 to the Hopi Indian Reservation. Kate lived in the mesa-top villages among the Hopi people for seven years, photographing, painting, and writing. Leaving Hopi in 1912, Kate built a pueblo-style house and studio in Prescott, Arizona, where she spent the rest of her life. Harvard's Awatovi Expedition 1935-36, Magic of the Painted Room. A traveling exhibit of the Hopi Kiva Murals, catalog and exhibit text relating to the Harvard Expedition, sponsored by the Smithsonian, Harvard University, and the Museum of Northern Arizona. Alberto Rios talks with author Carolyn O'Bagy Davis about surviving difficult times, Vivian, friendship, other visits and The Hopi Mesas. Full Extended Interview - Carolyn O'Bagy Davis - Books & Co.
Carolyn interview — the 1,174th for the Q.S.O.S. project and the 6th for the Arizona Quilters Hall of Fame Q.S.O.S. sub-project.